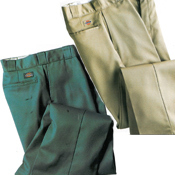 Dickies Original Work Pants! Permanent crease, never needs ironing. Finished with Scotchgard Stain Release for easy washing. Exclusive easy-alter outlet seam (two in one).